Saturday mornings are about to get shaken up as CBBC today announces the presenting line up for its new kids TV show Saturday Mash-Up! which smashes onto screens in September. Coming live from dock10, Yasmin Evans and Jonny Nelson will team up with Hacker T. Dog to give the weekend a rude awakening. Yasmin is currently presenter of BBC Radio 1Xtra’s Weekdays 1-4pm show. Stockport born, she began her radio career at the age of just 15 presenting on a Manchester community radio station. She studied Radio at the University of Salford where she was approached by the BBC to take part in their piloting scheme, which led to her joining 1Xtra. Yasmin says: "It’s an absolute honour to be a part of the show. Most of us can remember that, when we were younger, Saturday mornings were made for eating breakfast in front of live kids TV. Myself, Jonny and Hacker are ready to bring back that anarchy to Saturday mornings. You’re in for a real treat!" Jonny began his career in local TV after gaining a degree in broadcast journalism before being thrust into the world of entertainment reporting. His quick-wit and humour has made him a firm favourite on the red carpet reporting for a number of broadcasters channels. A huge football fan, Jonny, who is from Preston, has also presented for the premier league and when not working can be found obsessively bingeing on films. Jonny says: "I've been waiting 15 years for a reason to get up on a Saturday. I thought I'd probably take up jogging or something, but not end up presenting Saturday morning children's TV! The fact that it's back, it's live and I have anything to do with it is both exciting and alarming!" Keeping them on their toes with his cheeky one-liners and off-the-cuff remarks will be six-year-old CBBC regular, Hacker T. Dog. Hacker is from Wigan [he tells people often] and has a particular fondness for TV presenter Sue Barker, shiny red shoes and colourful shirts. He came second in Celebrity Mastermind 2016 with his specialist subject The Pet Shop Boys and can regularly be heard bellowing his memorable catchphrase "Alright Cockers!" to his fans on CBBC and 40,000 grown-ups on Twitter. Hacker says: "After a salary negotiation with the BBC I’m happy to say that I’m joining Saturday Mash-Up! Well, someone’s got to show Yasmin and Jonny how to do it!" 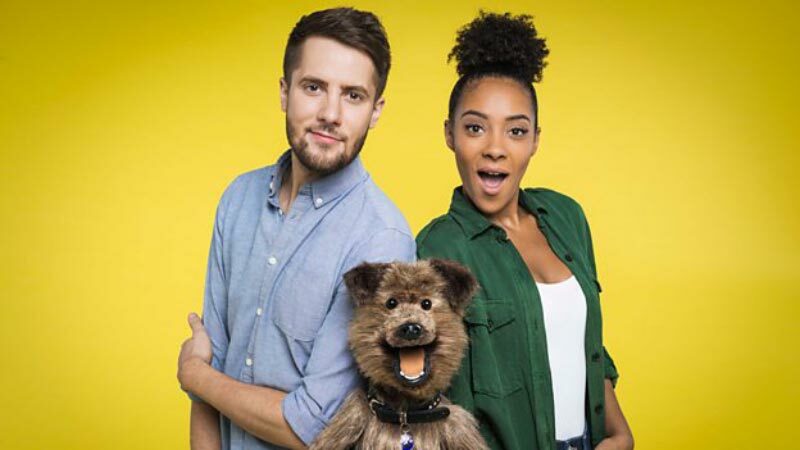 CBBC announced earlier this year that it was bringing back live Saturday morning kids telly, continuing the tradition of iconic Saturday morning programmes such as Going Live!, Saturday Superstore and Multi-Coloured Swap Shop. The new show will be packed full of celebrity guests, games, competitions - and the ubiquitous gunge - along with some of CBBC’s favourite shows. Broadcast live from The Studios at dock10 each Saturday, viewers in the studio and at home will also get the chance to interact all morning - quizzing pop stars and playing games on the CBBC digital platforms.